Kea’s last Listener was just over a year ago with his Dunmow Flitch based puzzle The Bard’s Coupling. (For those of you who tackle the EV, he had a fun puzzle at the beginning of this month with Something Wrong.) Here he seemed to be taking a leaf (pardon the pun) out of Dipper’s book with a gardening-based theme, the grid being in the shape of a flower. But what flower? Carnation and chrysanthemum came to mind, but a bit of googling revealed that it could be a dahlia. I was not in my comfort zone here, but I hoped that the unclued thematic entries wouldn’t take too long to deduce. We had a bit of spoon-feeding as well in that all entries went inwards, with clues grouped under Clockwise and Anticlockwise. In general, the clues were fairly forgiving. For example, 5ac Inside submarine pen, the Annapolis is oblivious (10) was a generous hidden, and 7ac Natty ball requires dressing without shame (9) a generous anagram. Eventually, the unclued flowers came through, 17 being my first with Y•L••WOXE•• leading to YELLOW OX-EYE. This is defined under ox-eye in Chambers and given as “the corn marigold”. That in turn gave “Chrysanthemum segetum” (obviously) and finally revealed the flower that we were celebrating, 9th September being Chrysanthemum Day. This is observed in countries such as China, Japan, Korea and Vietnam. All in all, less than two hours to solve this one, so thanks to Kea for a gentle week. I initially submitted this puzzle (my first) more than three years ago, so it’s satisfying to finally see it in print. I’d been intending to set a Listener for years and a lull at work gave me the opportunity. Naturally, as a programmer, I spent the first month writing software that could fill a grid with arbitrarily complex treatments and rules (although if I’d known about QXW, I could have saved myself some time). I’d already settled on Sir Gawain as a suitable theme: plenty of thematic material and obscure enough that most solvers wouldn’t be able to take shortcuts. The “beheading game” lent itself to an answer treatment (and to different treatments for the two protagonists) and the exchange of kisses for animals gave me a suitably obscure title and more thematic content in the grid. I also could not give up the chance to include some Middle English and managed to find a relevant quote that was fairly easy to understand and only had a single obsolete letter, thorn (þ). As it represents ‘th’ in a single letter, a clash seemed like a logical way to indicate it. At that time, the name BERTILAK, the recipient of the kisses, was also revealed in the grid. This first version was rejected – I’d tried to cram too much into too small a grid – but Roger liked the theme and encouraged me to rework it, suggesting some changes and a new grid layout. This also reminded me that the aim is to produce something fun to solve, not just to show off how many tricks you can fit in one grid. A year later, I found time to work on it again. I decided to start from scratch, expanding the grid from 12×12 to 13×13, removing BERTILAK, but adding THORN (as the letter ‘th’ could equally be ETH). This gave me a lot more flexibility and choice on the final words: so I could reject the grids where ten of the answers were types of rock or half of them were plurals. Once I’d got the software to fill the grid (with the movable “heads” spelling out names and a single clash), I could move onto the clues. The across clues were straightforward, but the downs, with up to three letters removed, were a challenge; it took a few weeks to get the allocation of letters to clues right so that each one was viable. The final piece of the puzzle was to link the deletion of letters to the title, rather than explicitly mention deleting letters in the preamble (as suggested by ‘Eck, who test solved the puzzle and gave other valuable advice). This required rewriting a few clues, as there were none with a single letter removed, but I think made it all hang together better. The second version made it past the vetters relatively unscathed. 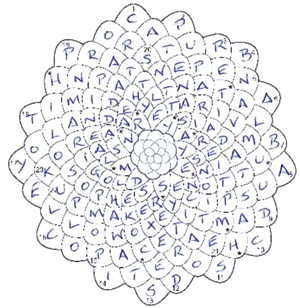 In spite of all the thematic content, my intention was that solvers could complete the puzzle without searching for the story or the quotation: all the content can be deduced and the symbol/meaning for thorn is given in Chambers. I await inspiration for my next Listener, which hopefully won’t take quite so long. … at least that’s how I am reading it. The Fox, the Deer and the Boar (that was the order I found them in) and the line of verse ending ‘hit to the erthe’ let me identify Sir Gawain and the Green Knight. I’ve never read the original but know of it (some Tolkien connection too, I think?). Well, some of the details of this one has baffled me. I could find all the deletions required from the Down clues. I could even, with some investiGoogling, put them together to create … what exactly? Well, my row’s full of thorns (or something like that). Is that the head (hede) being removed from the ‘halce’ (presumably, halse, the neck)? So the heads of some answers will be moved / removed?? And assuming all the Downs are entered unchanged, then I can deduce that the removed head of each Across clue may move some spaces to the right. But from there on I am missing something! What determines if the first letter of an across clue moves and, if so, by how many spaces? Does the ‘earth’ bit mean they have to move to be next to an E (for Earth), perhaps? Sitting here on Saturday evening, I checked the moved letters again. And found they spelt out T-H-E … G-REEN KNIGHT!! I then went back and checked the ones that hadn’t moved, and they spelt out SIR GAWAIN!!! Amazing! Even for the parts of the puzzle I do understand, this is a superb creation – thank you Somniloquist!